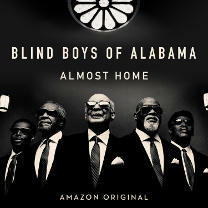 George Graham reviews Blind Boys of Alabama's "Almost Home"
A revival of interest in classic-style soul music including by a new generation of performers, has also provided renewed attention to one of the main sources of inspiration for the soul scene, African-American Gospel music. And in recent years Gospel-inspired and some traditional groups have again been finding wider audience beyond the church setting, something that had also happened decades ago. This time we have a new recording by the longest running group on the black Gospel scene, who have been together since 1939 and still featured two original members, The Blind Boys of Alabama. Their new release, close to their 50th in a recording career that goes back to 1948, is called Almost Home. When they formed, the Blind Boys of Alabama’s name was literally true. They were all about nine years old and all but one of the original members was blind, and the product of schools for the blind in the Jim Crow South. They gradually began to win audiences through their touring mainly in churches, though in the 1950s they had some wider audiences, after some initial hits, such as their first single, I Can See Everybody’s Mother But Mine, from1948. With the popularity of soul music in the 1960s and 1970s, their purist approach to Gospel brought some lean times, but in the 1980, the Blind Boys were invited to be part of a theatrical production, The Gospel at Colonus, which won two OBIE Awards, and helped put them back on the map, so to speak. They have been touring and recording nearly non-stop since then, increasingly collaborating with a wide variety of rock and blues performers from the secular world. For the new album, their manager Charles Driebe brought a film crew to the homes of the two surviving original members, Jimmy Carter and Clarence Fountain and recorded extensive interviews about their lives. Then Driebe provided the video interviews to a number of songwriters, inviting them to create songs based on those experiences as related in the interviews. They received over 50 submissions and selected some that the group memerbs felt best conveyed their life stories. The group also cover some older songs and a 1960s Bob Dylan composition that is increasingly being adopted by Gospel singers. Almost Home is also distinctive in that it was recorded in four different cities with some Grammy winning producers, Jon Leventhal in New York, Vance Powell in Nashville, Chris Goldsmith in Seattle and Steve Berlin, of the Los Lobos band, in Muscle Shoals, Alabama. The result is a satisfying and honest-sounding record that comes off as nicely autobiographical. With the exception of the New York sessions, most of the tracks feature the Blind Boys’ regular touring band, so the backup is tight and the musical rapport strong. Almost Home, the new album by the Blind Boys of Alabama, whose two surviving founding members have been making music together for a remarkable 78 years, shows that the group gives no sign of slowing down. The concept of the album is interesting, with various songwriters being invited to create songs based on reminiscences by founding members Jimmy Carter and Clarence Fountain. The album is also interesting in that it involved sessions in four cities with four different producers, which are arranged on the album in groups of three. Several of the songs become autobiographical, and consider mortality and the afterlife, though that’s certainly a staple of Gospel music. The different sessions are all tasteful and not that dissimilar in sound, with the differences being more subtle, than for example the different instrumentation that you might expect from four geographically separated sessions. Our grade for sound quality is an A-minus. The vocals are fairly clean in sound but could have been better, and the dynamic range is undermined by the usual heavy volume compression. The Blind Boys of Alabama, with their wide-ranging collaborations over the last few years, have taken African American Gospel music to new places and new audiences, while staying as authentic in their sound as ever. The result is another memorable album from a group that has made many.